The spot localization module (i) identifies the position of each spot on the array, so that the name of the spotted clone can be associated with the correspondent spot; and (ii) establishes the borders between the neighborhood spots letting one to perform further data processing procedures (i.e. to extract quantitative information) for each spot independently of the other neighborhood spots. Visually this results in the generation of a grid covering the image. The spot localization algorithm is fully automatic and robust with respect to deviations from perfect spot alignment and contamination. As an input, it requires only the common array design parameters: number of blocks and number of spots in the x and y directions of the array. The spot quantification module for one-color images performs segmentation of the spots and estimates the averaged spot and local background intensities. The spot quantification module for two-color images estimates the ratio of the measured intensities in the two color channels at each spot reflecting differential gene (cDNA technology) or protein expression or a change in DNA copy number (CGH experiments) between the test and control samples for the corresponding gene. This module includes algorithms based on the linear regression and segmentation of the spots. A special procedure for detection and removal of the aberrant pixels has been developed to make ratio estimates more resistant to array contamination. It ensures more consistent ratio estimates obtained from different algorithms, and allows delivery of a single trustable ratio value. The quality control module provides a value of spot quality reflecting the level of confidence in the obtained quantitative estimates at each spot. These quality values can be used either directly to flag out some spots with the quality lower than the user-defined threshold, or in the follow-up analysis as a weight controlling the contribution/influence of the obtained ratio estimates. The unique spot quality value for a spot is derived from a set of marginal quality parameters characterizing certain features of the spot. The contribution of each quality parameter in the overall quality is automatically evaluated based on the user visual classification of the spots, or using information available from the replicated spots, located at the same array or over a set of replicated arrays. 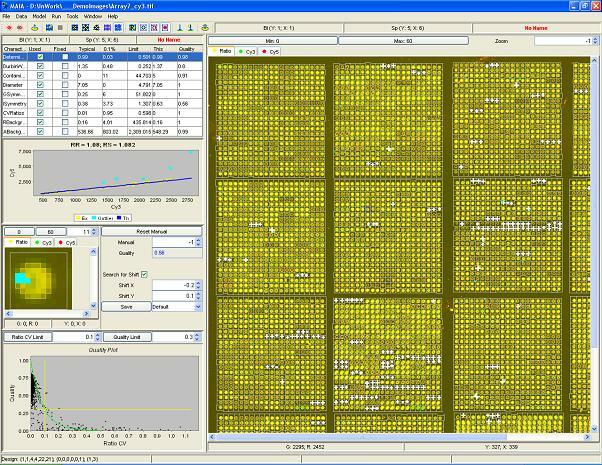 The image simulator allows the generation of a broad spectrum of microarray images with different types of contamination (like non-specific hybridization and dust) and noise. Since in simulation experiment the true values of the ratios are known exactly, it allows one to evaluate, to test and to compare different algorithms for microarray image processing objectively.